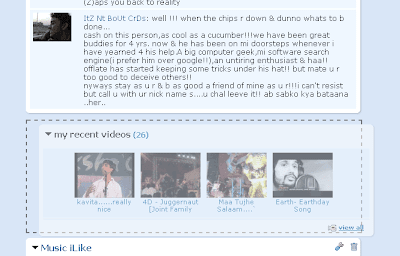 Orkut has launched another Facebook like feature for its users. They have launched a new feature by which you can change the way your profile looks. You can change the position of various elements in your profile page just to suit your taste and preference. This can be seen as Orkut's latest trick to attract users to itself, as this is Google's home grown Social Networking Website. As is clearly visible Orkut is way behind MySpace and Facebook. So The drag and drop feature allows you to change the way you place different blocks on your profile page. With Orkut Apps, many apps tend to create a page element on profile page and you may wish some elements to appear before other. So all you have to do is Just drag these blocks on your profile page and rearrange them. But you can't place any block before the Full Orkut profile element. All you have to do is place the pointer onto the header of any page element and drag it up or down with the mouse being pressed. Simple to do and good to implement. This has been Orkut's latest feature taken directly from Facebook after Status Updates, Recommended Communities and Photo Tagging. Nevertheless they are the moves which would be applauded by many Orkut users. Yea Sid, Actually this is an irony amongst Indians to choose something that's not popular worldwide. Yea rightly said Narendra. Actually I am also pretty much inactive on orkut now but the developers have just risen from the bed.